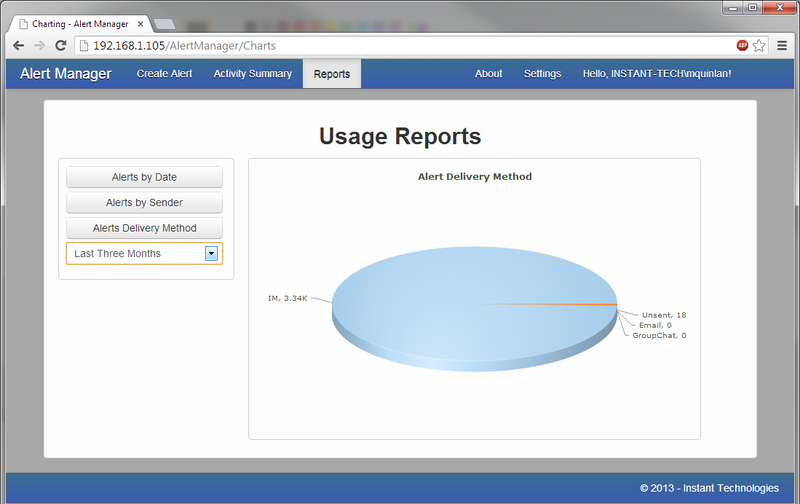 Instant Technologies’ Alert Manger gives you the power of real-time communications, to meet your need to quickly disseminate time-sensitive information. You can easily create and instantly send messages to individuals, groups, or to everyone in your organization. You can schedule these messages to deploy at a specific time, and then to ‘expire’ at some later point, so users who are away don’t get bombarded with obsolete communication when they get back. 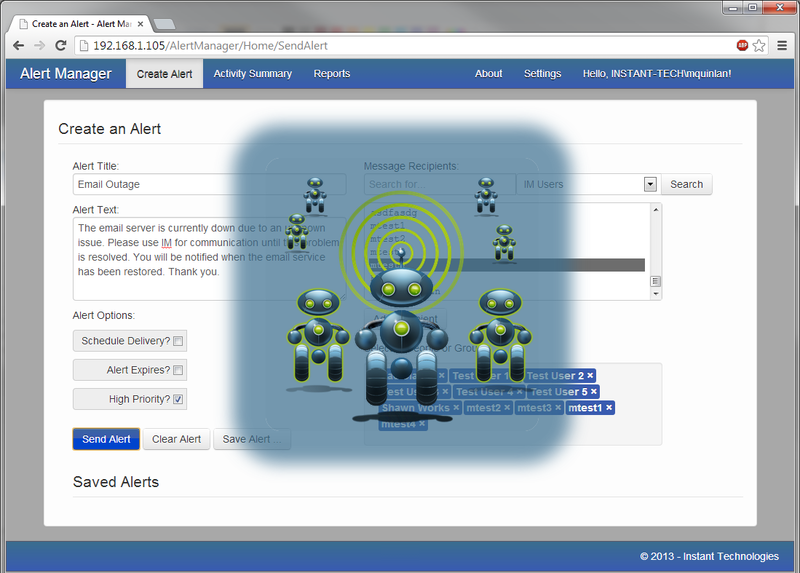 Instant Technologies’ Alert Manager turns Microsoft Lync® into a massive, instant contact tool to deliver critical information quickly and precisely to the people who need it across your organization. 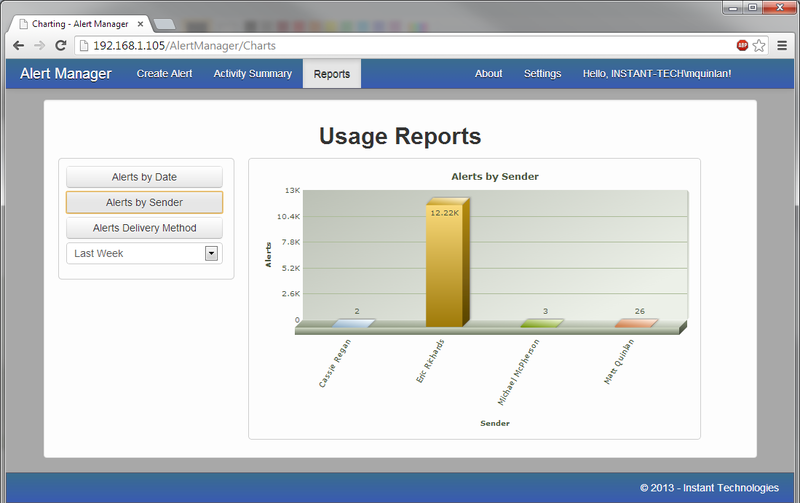 Alert Manger’s primary interface is an “Alert Table”, showing individual messages, as well as summary information and detailed reports. This main display lets the user instantly know what messages have been sent, which ones are waiting to be sent, and who sent it out. More detailed examination of individual messages yields information such as when it was created, when it will expire, to whom it was sent, and how they received it. Save your alert templates for easy use at a later time. Create templates for foreseen issues, and let everyone know with only a few keystrokes. Log in to the app and with a few clicks, everyone who needs to know – does! Unexpected email server crashes inevitably trigger a flood of calls to the help desk. 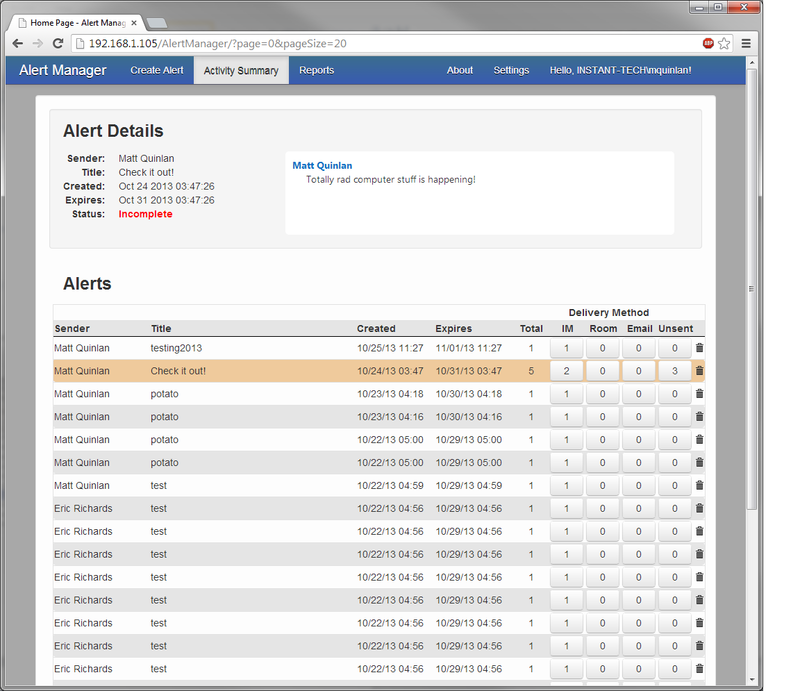 With Instant Technologies’ Alert Manager, the help desk can proactively inform users that IT is aware of the problem and also provide updates on when service will be re-established –letting them focus on fixing the problem, rather than fielding calls. 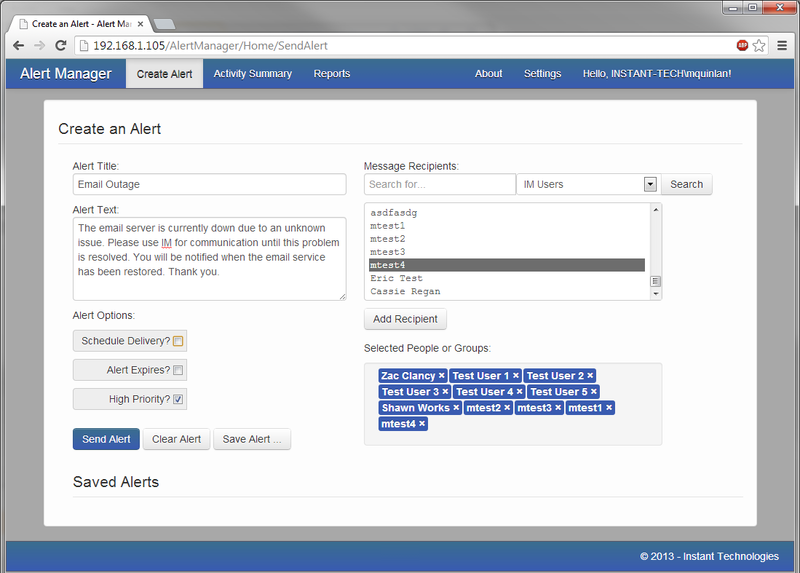 Since Instant Technologies’ Alert Manager can send messages by Active Directory group, it is uniquely suited to messaging users by natural methods of association. 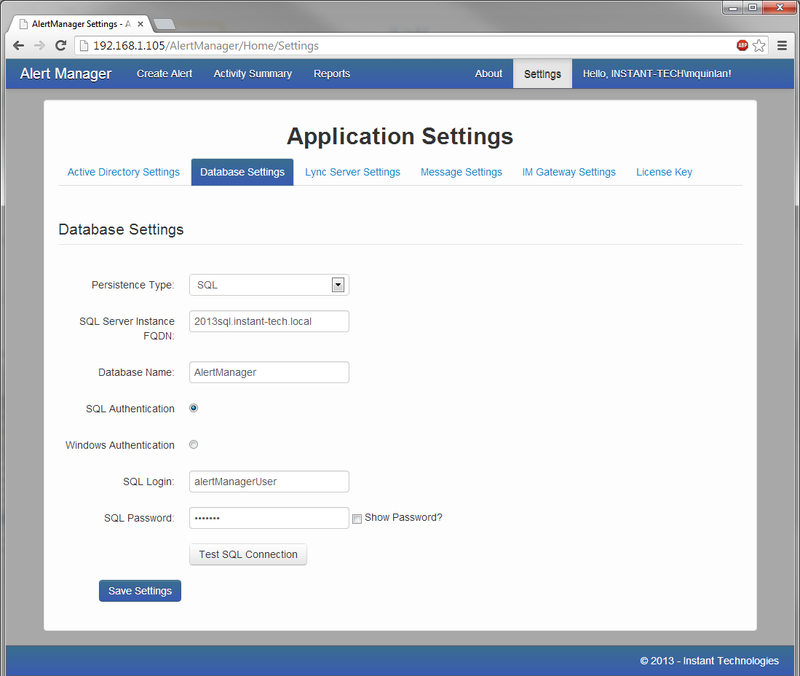 Whether that’s by job role or geographic location – however Active Directory is arranged, Alert Manager is built to match it. So if one building had to be closed in the face of, for example, an incoming storm, everyone in that location’s Active Directory group can be messaged in just seconds, letting them take necessary precautions. IM is a more efficient tool for managers to relay time-sensitive information to staff — an impromptu meeting, a big new client, free donuts in the break room— because the messages are only received by chosen groups who are actually logged in. 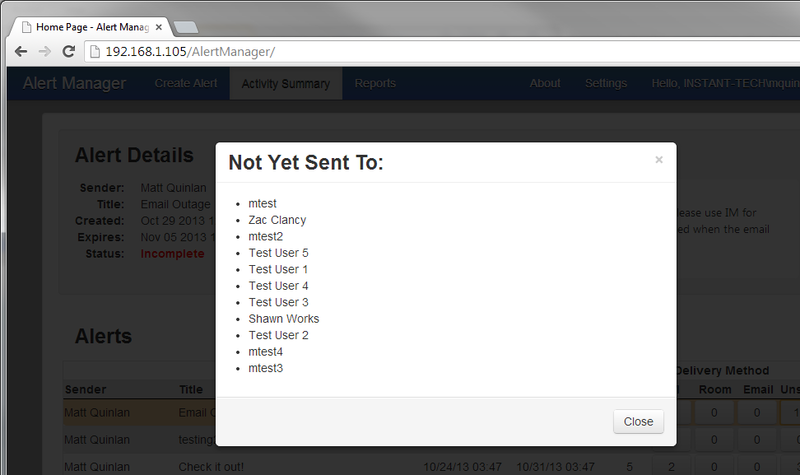 Instant Technologies’ Alert Manager facilitates real-time delivery of information while also eliminating overstuffed Outlook inboxes for employees who would otherwise have received the news by email. Email and instant messaging are the two most dominant forms of communication in most workplaces today, and the Email-2-IM Gateway merges both environments with the simple @IM sub-domain. That is, instead of sending an email to jwayne@instant-tech.com, where it would join the backlog of unread emails, we send one to jwayne@im.instant-tech.com, that user gets an instant message immediately. 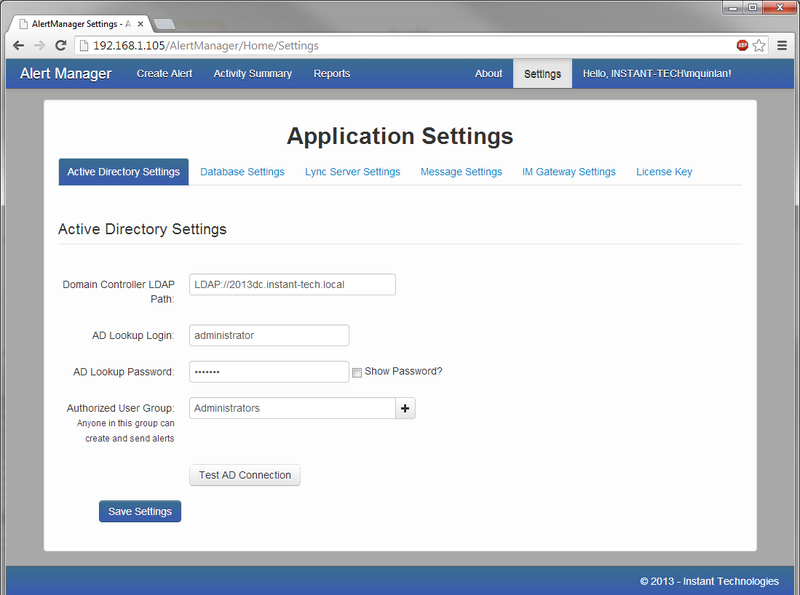 The Email-2-IM Gateway provides the ability send emails as instant messages using Instant Technologies’ gateway server. 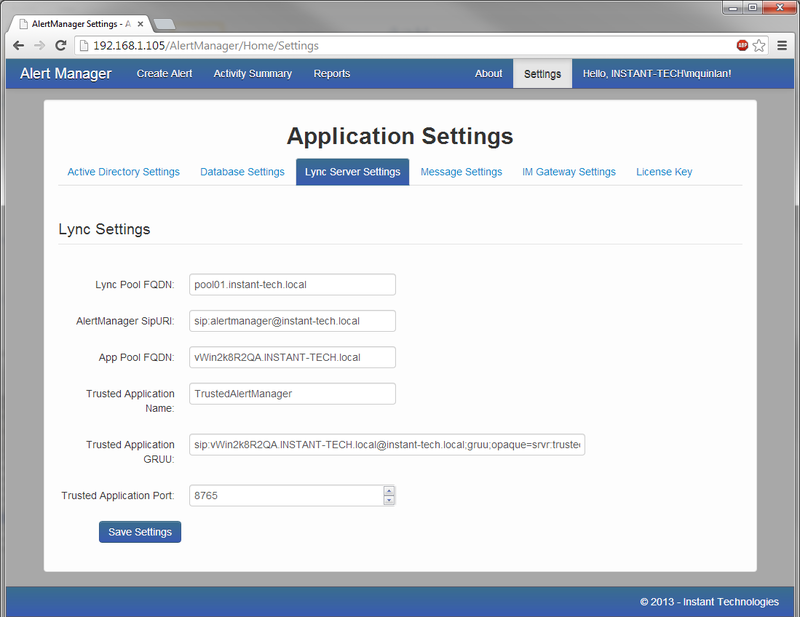 The server dispatches Lync® IM messages to individuals, distribution groups, and Lync® 2010/2013 group chat rooms, which means that a single email doesn’t have to go to a single recipient or group of recipients. Just like sending an email to a distribution list, a message to itsupport@im.instant-tech.com will deliver an instant message to everyone on that list. 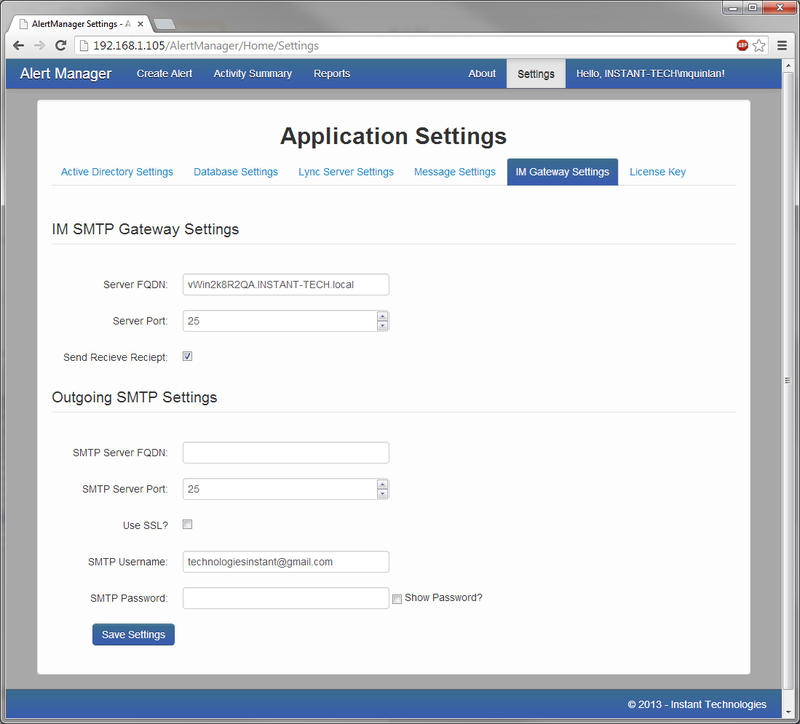 The setup of the Email-2-IM Gateway is simple and does not require any complex configuration or maintenance. The application can receive emails from any internal user, via any standard device (computer, smartphone, tablet), and the message will be transparently converted into the appropriate IM. 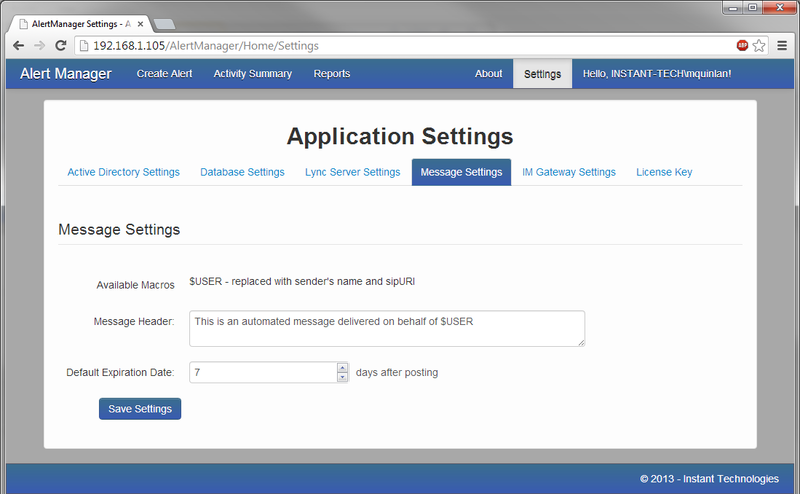 Alert Manager is an on-premise application that can be installed on either Windows Server 2008 R2 or Windows Server 2012. Install is typically completed within 30 minutes. 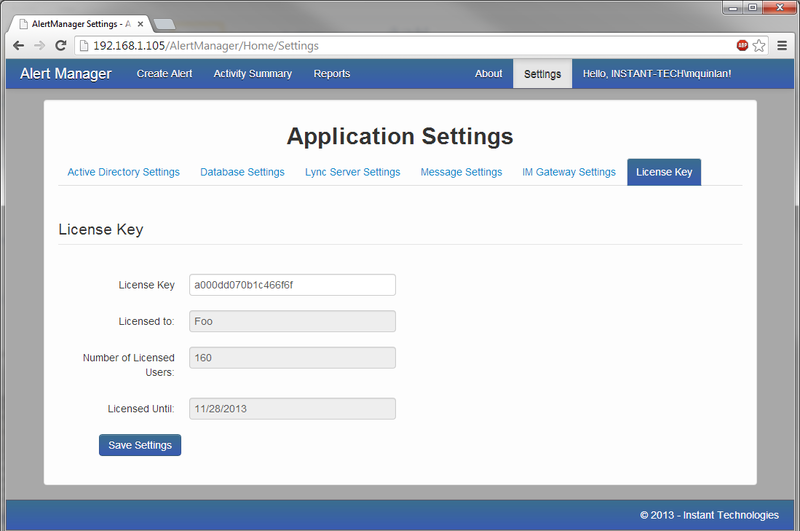 Our automated tools quickly create all the certificates and application pools needed for the service to run effectively. 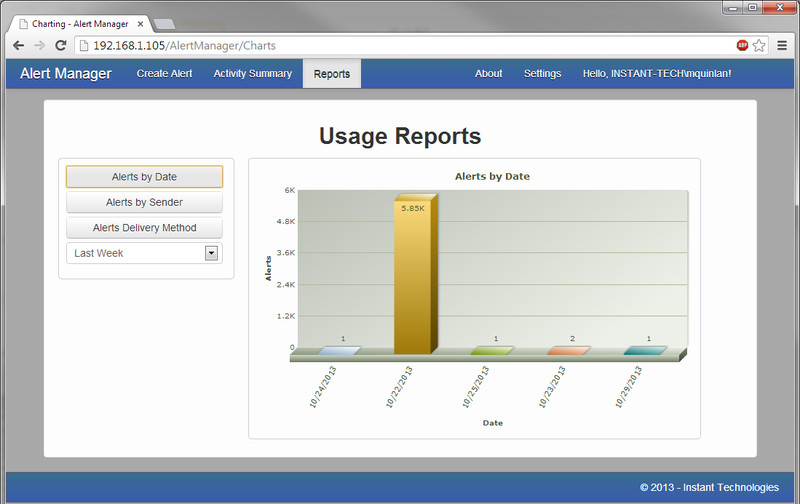 Alert Manager was designed to be accessed from a desktop or laptop computer. The application can be accessed from a tablet or phone, but the application is not currently optimized for those platforms.